Objectspace’s major exhibition ‘The Room’ explores how interior space is constructed and expressed through ornamentation and design. Knight Associates contribution to ‘The Room’ examines ideas of waste and production inherent to the architecture and design industry, and how these can be reinterpreted through craft and making processes. Untitled (Presque Rien) references Duchamp’s readymades and composers of the Musique Concrète period through the manipulation of found materials. 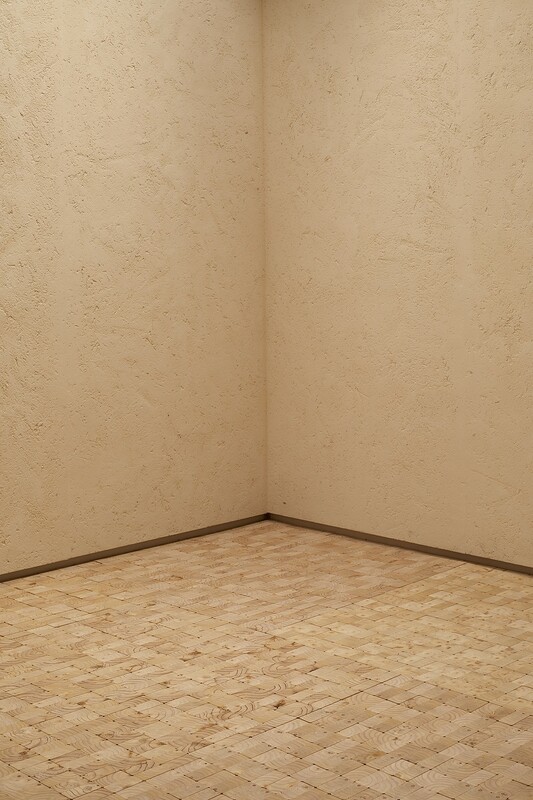 The space consists of over three-thousand timber off-cuts laid to form an elaborate parquetry floor and collected woodchips and sawdust – combined with a natural clay and silica mixture – to create a rough, stucco-like plaster finish to the walls; all materials salvaged from the construction process of ‘The Room’ itself. The space creates an environment that demonstrates the immersive potential of material craft and tactility through processes of reclamation and reuse. The interior bears no further intervention beyond its surface treatment and seeks to reevaluate waste material demonstrating that, within excess, we can find further expression. ‘The Room’ is a series of interconnected built structures designed by Knight Associates, featuring curator decorative art and design at Te Papa Justine Olsen in collaboration with contemporary jeweller Karl Fritsch, curator and writer Emma Ng, artist and curator Ane Tonga in collaboration with artist Ani O’Neill, and interior designer Rufus Knight with architect Mijntje Lepoutre. Objectspace ‘The Room’, 6 Apr–19 May 2019. In collaboration with Calavera Ltd. and Ambitec. Established in 1968, Les Mills is a world-leading fitness and lifestyle brand based in New Zealand committed to improving health and wellbeing aspiring to create ‘humans fit for life’. Les Mills New Zealand operates 12 nationwide facilities and offers wide-ranging group fitness classes and tailored personal training programs in concert with Les Mills International workout programs being licensed in 100 countries with over 130,000 certified instructors globally. The Auckland City campus is the global hub for training, development, and innovation and occupies a large inner-city footprint boarded by arterial Wellesley and Victoria Streets in Auckland’s Central Business District. With redevelopment of the wider precinct staged over the next 5 years the need to enhance member experience, meet growing capacity requirements, and create a showcase for the future of group fitness was imperative. The newly refurbished space sees a large industrial volume repurposed to accommodate three new offerings for members – functional training, boxing, and 100-bike immersive cycle studio: the world’s largest – as well as amenity and services upgrades and improved circulation to create a refined offering for the expanding membership and new spatial signature for the Les Mills brand. The insertion of a 350sqm cycle studio, clad in mirrored bronze-tinted stainless steel, creates a strong delineation of the space allowing the functional training and boxing areas to sit discreetly on either side and provides the requisite acoustic and services separation. 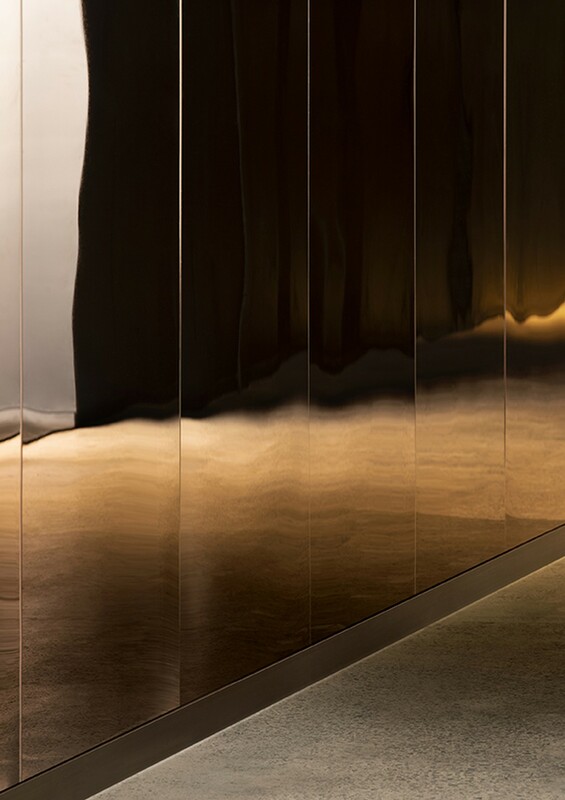 The mirrored finish of the immersive studio dematerializes in its industrial surroundings adding a strong sense of continuity to the smaller open-plan training areas and creates a kinetic interplay between lighting and the movement of bodies. Completion of functional, boxing, and cycle studios in March 2019 concludes the first phase of design with current works underway on façade, lobby, and upgrades to member facilities within the original heritage gym space on Victoria Street. Completion slated for mid-2021. In collaboration with Monk Mackenzie Architects and Alt Group. 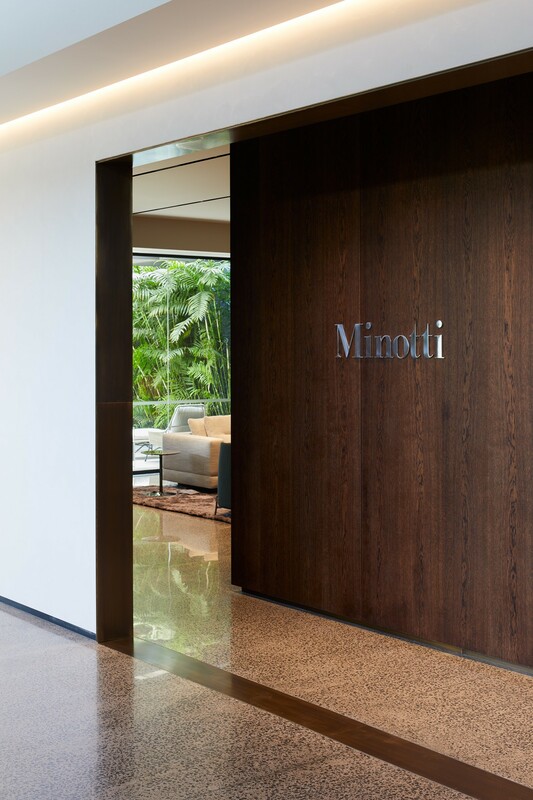 The Minotti story centers around 70 years of Italian excellence in furniture and product manufacture and their signature of tradition and innovation – it was this breadth of design history which allowed us to create a space that was orderly but had classical undertones. 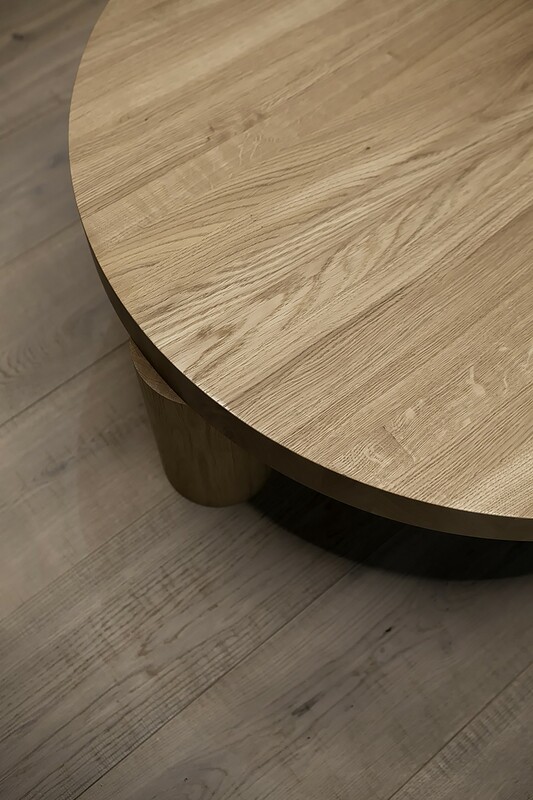 The aesthetic of the furniture collections is understated, timeless, and always include a ‘sartorial detail’; this afforded us the opportunity to pair robust materials - such as aged brass and smoked Oak - against soft tactile surfaces - such as plaster and linen – with a sense of permeance. 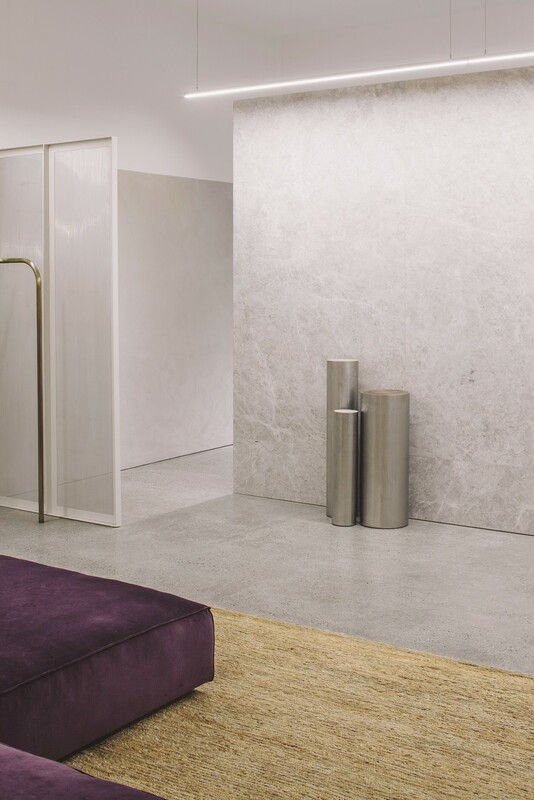 The Auckland showroom aimed to be sophisticated and refined but balanced with a sense of domesticity – with a strong emphasis on materiality and detailing. In collaboration with ECC Ltd. The Great Eros Greenwich Avenue flagship is an exploration into material sensitivities that align with a timeless sensual appeal and reference the brands Italian manufacturing heritage. Inspiration was taken from a wide range of sources but centred around early-to-mid-century European modernist artists - such as Valentine Schlegel, Jean Arp, and Brancusi - whereby fluid forms take on primitive and anthropomorphic qualities. This countered by a formal and material influence from Italian Architects Carlo Scarpa and Carlo Mollino whose proportion and detail was interpreted through a corporeal lens. 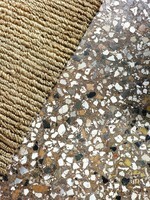 The flagship develops themes from the first store on Wythe Avenue creating an enveloping interior that focuses on natural materials and tactile surfaces, such as oiled timber, terracotta, aged brass, plaster, and silk. A large central display space showcases The Great Eros’ full range of garments, literature, and objects while, as privacy is essential to the customer experience, two generous dressing rooms discreetly flank the central display area inviting a confident and stimulating atmosphere. In collaboration with Reid & Taylor Studio. Change House at 150 Featherston Street is a 1930’s office building designed in an inter-war transitional style that incorporates elements of Art Deco, the Chicago School, and New York Skyscraper styles. The design of Aesop Wellington took cues from the site’s surrounding commercial context and proximity to the nearby Lambton Harbour and adjoining harbour sheds; their strong association to trade, industrious maritime heritage, and turn-of-the-century European design influence. The materiality of the store aims to reflect the inherited history of law and commerce practised at Change House. 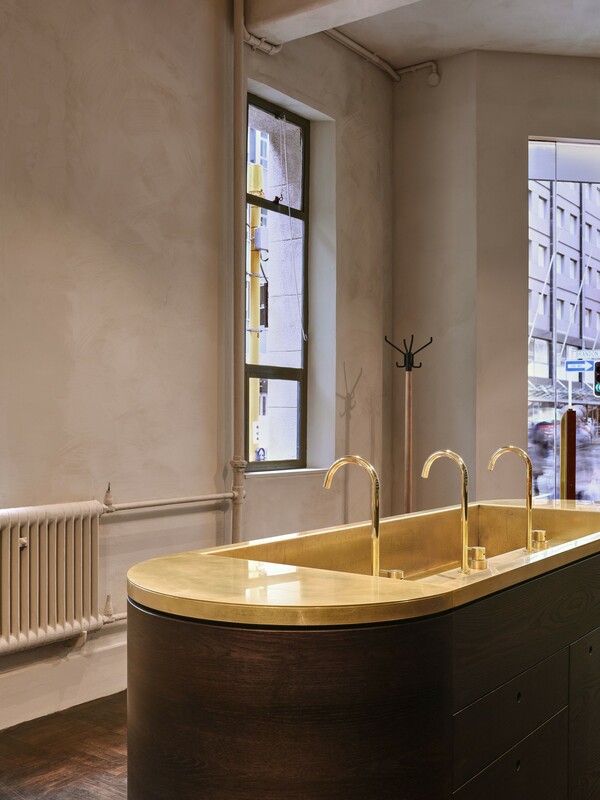 Basket-weave parquetry, oiled timbers, polished brass, and specialist plaster finishes propose a layered sense of history in concert with a contemporary retail experience. The interior display wall references the skilful positioning of the building on its corner site but introduces a Modernist spirit through the interplay of a large unbroken gesture where function is recessed, and form remains absolute. The transactional aspects of the store mirror this by standing freely as pure abstraction, with storage and functionality discreetly integrated. Conversely, a classicist material simplicity contributes to a feeling of nostalgia as if the retail display has occupied one of the buildings original bureaus. 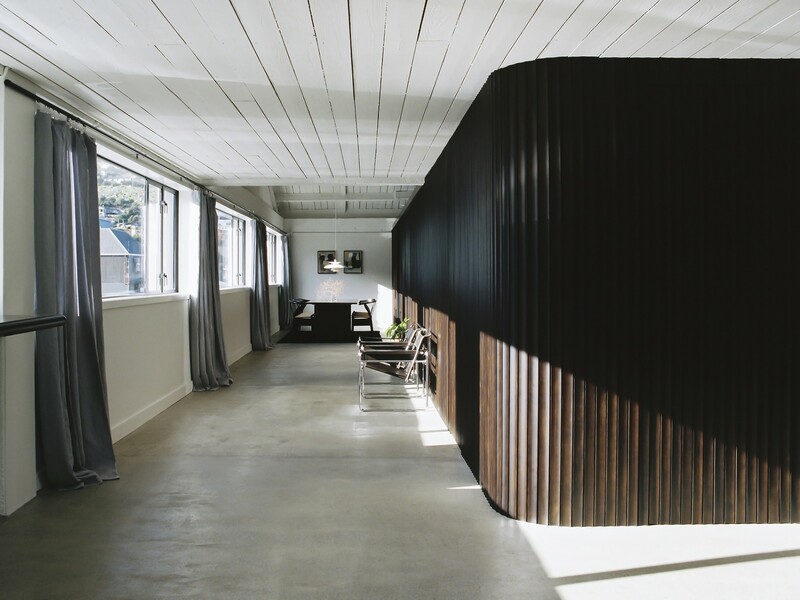 The Sons & Co. studio is situated in a 150sqm warehouse space, above a ship chandlery, in Lyttelton. For the client Lyttelton was a very conscious choice, removing themselves even further from the world, confident they can still attract clients. The new studio needed to be a physical representation of that intent and idea. They have no logo, website or social media presence, so the studio is the brand. The brief was a studio for six people. The client uses the word studio in preference to office as they believe there's a difference. They’re a very small team of friends. They work very closely together, they have an implicit understanding. They enjoy ‘pure’ design. By that, they mean they’re attracted to design in its most direct form. Work full of rigour, that’s original, uncompromising, but often has an element that is pure whim, nonsense or "just, because". Metal trusses, timber sarking, and polished concrete created a robust industrial canvas from which the design could reference. 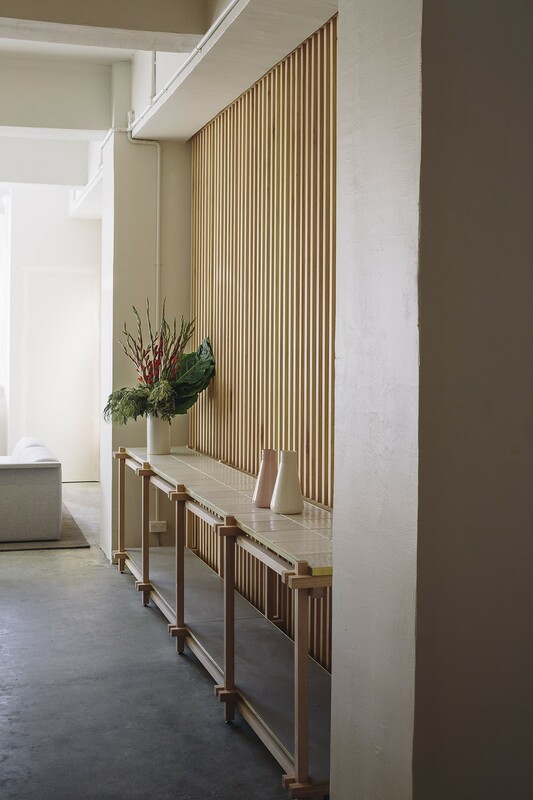 Stained timber flutes, individually milled, were introduced in the form of wall-claddings and large sliding doors to delineate the studio environment from meeting spaces. 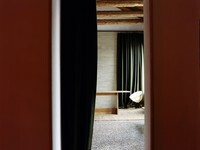 The clients like an ordered environment, calm, beautiful and refined. They believe the way in which creative people work hasn't changed since the birth of time. The design of the studio didn’t need to facilitate a process, they’re not of the "design can change the world" school, but they do believe when design is good, really good, it raises the human spirit. Kowtow was established in 2007 with the desire to create an ethical label that would be the example of a fashion-forward, global thinking business. 11 years on, the label opens its flagship store in their hometown of Wellington with an emphasis on natural, locally sourced and sustainable materials. The store articulates minimalism, simplicity, and generosity. From the outside, two large windows frame the space. 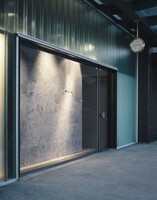 Instead of traditional displays, passer-by’s have an open and transparent view of the store’s day-to-day life. Floor-to-ceiling structures divide the space with a strong rhythm and create a bespoke racking system. The large point of sale anchors the space and invites conversation. 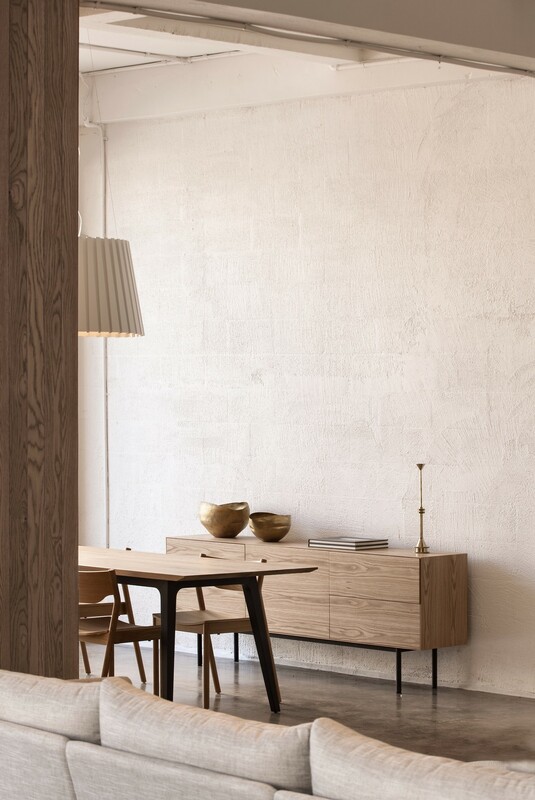 All aspects of the store have been selected with sustainability in mind; sustainably grown and milled timber, handmade ceramic tiles from Gidon Bing, FSC certified joinery and textiles. In collaboration with Makers of Architecture. 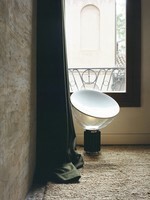 Simon James Design is a leading voice in contemporary furniture and homewares. Their Newmarket flagship, situated on Osborne Lane, uses modernist art as a point of departure to create a refined canvas from which to showcase a growing international brand stable. 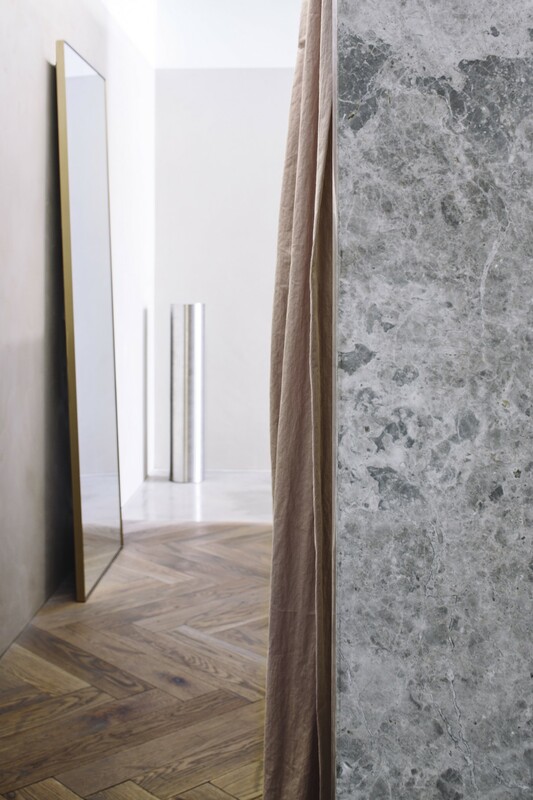 The neutral interior palette combines marble, brushed stainless steel, off-white plaster, and selvedged Oak to create an essential, yet tactile, retail experience. The existing 60-sqm site – previously a lean-to – had limited visibility from the street despite a prominent corner position. Large punctuations were created in the façade and sill heights of existing windows dropped to create a more vibrant and engaging shopfront while allowing generous natural light deep into the space. 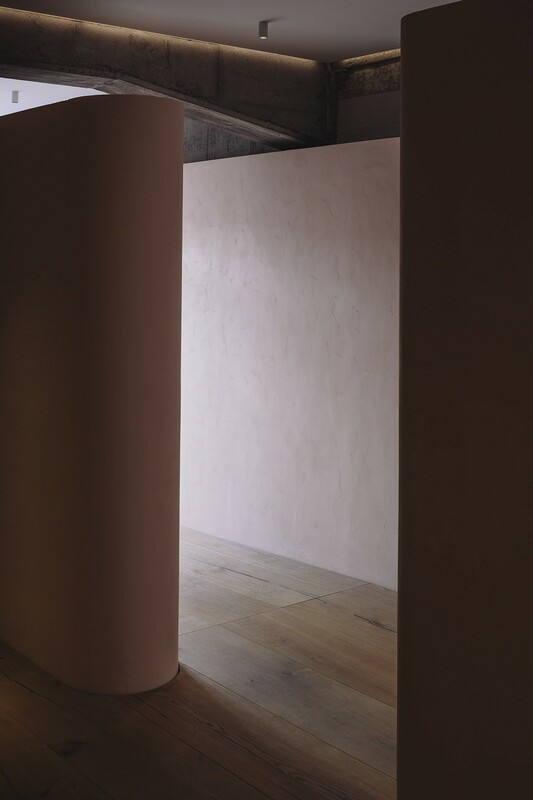 The resulting ceiling geometries were treated with a two-tone specialist plaster finish to diminish their apparent architectural complexity and fill the space with an unexpected and uplifting textural quality. The point of sale and jewellery consult station are described by two freestanding timber and stone cabinets, with corresponding negative details, centrally located between the display wall and the Osbourne Lane windows allowing unencumbered movement throughout the store while storage, functionality, and point of sale are discreetly integrated. Resident's 'Dark Matter' exhibition aimed to build on the previous three year's participation at the Milan Salone and the opportunity to showcase Resident's latest collaborations with NZ and UK-based designers presenting a collection of furniture and lighting as a bold, enduring, and further establish their exposure in the European market. The exhibition incorporated refined monolithic geometries with integrated lighting and display elements and, through these volumes, aimed to demonstrate a sense of permanence and weight in a what can otherwise be an ephemeral and frenetic environment. The conceptual ideation was borne of the New Zealand landscape and our exposure to our unique and harsh geography. As the Resident footprint occupied a 100sqm corner site, establishing and maintaining lines of sight for the product was imperative. 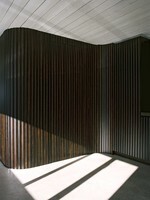 The three large volumes – crown cut ply oiled dark black – not only offered the featured lighting a vivid backdrop but also allowed the spatial experience to maintain a sense of order and containment. The design aimed to be immersive; creating intrigue for visitors and curating their experience within. The ‘Dark Matter’ exhibition presented Resident in a bold and distinctive tone while the simplicity of the design allowed for flexibility to expand and participate in other international furniture fairs with a similar immersive quality. The exhibition established a palette for the Resident brand that speaks, at once, of place but also of modernity and their position in a design-led global market. Lonely Newmarket is the most recent flagship, and second branding touch-point in Auckland, located in the historic Hayes Building on Teed Street at the centre of a fast-paced retail precinct. 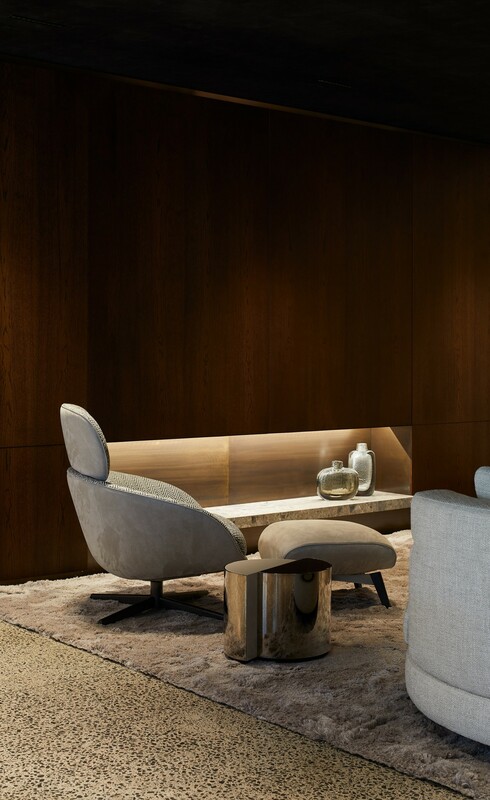 The space makes a departure from the cool modern delineation of the previous Ponsonby and Wellington stores with a soft and enveloping interior that focuses on natural materials in a tactile palette of Oak, plaster, polished brass, and cast bronze. 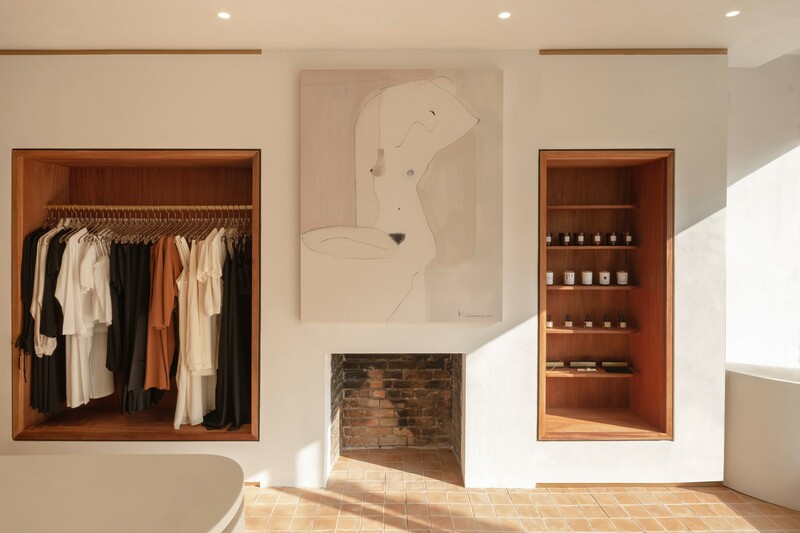 From Monet’s ‘Les Nymphéas’, to Gabriella Crespi’s fluid brass forms, to Villa Noailles, the space speaks in calm and confident forms but keeps service and customer experience at its heart providing a serene and intimate showroom atmosphere to experience the brand and accessory collections. Continuing to explore female design histories the Newmarket flagship incorporates the work of mid-century designers like Eileen Gray and Charlotte Perriand and pairs these with contemporary artists and makers - such as specially commissioned fixings in cast bronze from New Zealand artist Kate Newby - to strengthen Lonely’s values of creativity and empowerment. The Lonely brand speaks strongly about layers of intimacy so a space that focuses on the customer, their experience, and the process of buying lingerie still remains essential. The Lonely Newmarket flagship further expands our vocabulary of what it means to be modern and romantic. Te Koha – meaning gift, offering – provided a space for visitors to La Biennale interested in learning more about New Zealand Architecture and Design to immerse themselves in our design culture. During the 2016 Venice Architecture Biennale, Te Koha hosted events organised by event patrons, partners and supporters. It was a base for cultural events, including symposia on architecture, innovation, and the sciences. Te Koha was also supported by Te Mātau – meaning knowledge, understanding – a small reading space in which visitors to New Zealand’s exhibition can discover more about creative industries through selected publications and writings. 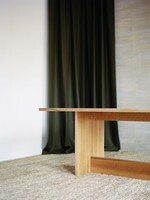 The design strategy for both spaces was to work with innovative New Zealand-based suppliers and locally source materials in order to develop an identity for the rooms that was sympathetic to the richness and tactility of New Zealand’s natural landscape. Te Koha and Te Mātau would not have been possible without the commitment of our manufacturers and suppliers. Both rooms have been generously supported by Abodo, David Trubridge, Nick Radford, Nodi Rugs, Philips Selecon, Resene, Robinson Interiors, Rockcote, Resident and Vanda Holdings. With special thanks to Campaign for Wool NZ, Camira Fabrics, Okewa, and Ngā Aho. Auckland flagship for Wellington-based fashion label. The International apartments combine a global set of references with a contemporary design language and places them in a specifically New Zealand context. Sanctuary Group has developed a dynamic and forward-thinking architectural form while the interiors are refined and sophisticated. This coupled with the ability to ‘live outdoors’ – in the large conservatory spaces – makes The International justly unique. Unrivalled in aspect and connection to green space, in concert with a prime urban location, gives The International a confident placement in the global market but also presents a new benchmark for high-density living Auckland. Lonely Wellington is an extension of Lonely’s branding touch-points and service focus for New Zealand’s capital. 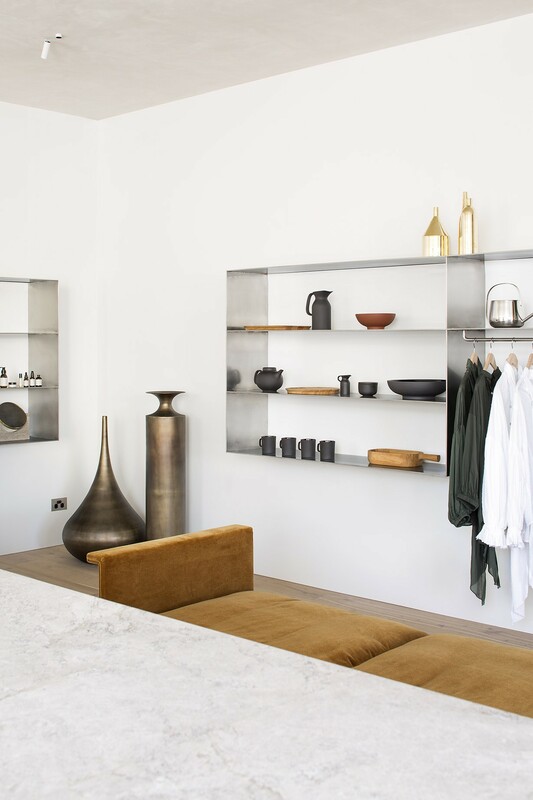 Continuing with an atmosphere of intimacy and warmth, the store aims to capture the quiet intellect of the Wellington customer with materials and finishes more suited to their cooler climate. 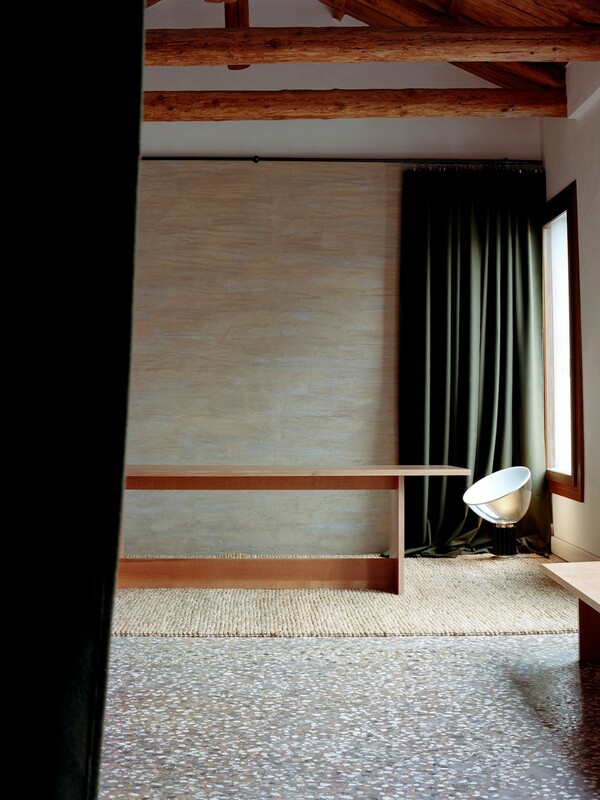 For the one hundred square-meter space, the design direction is again a dialogue between hard and soft surfaces – between confidence and privacy. 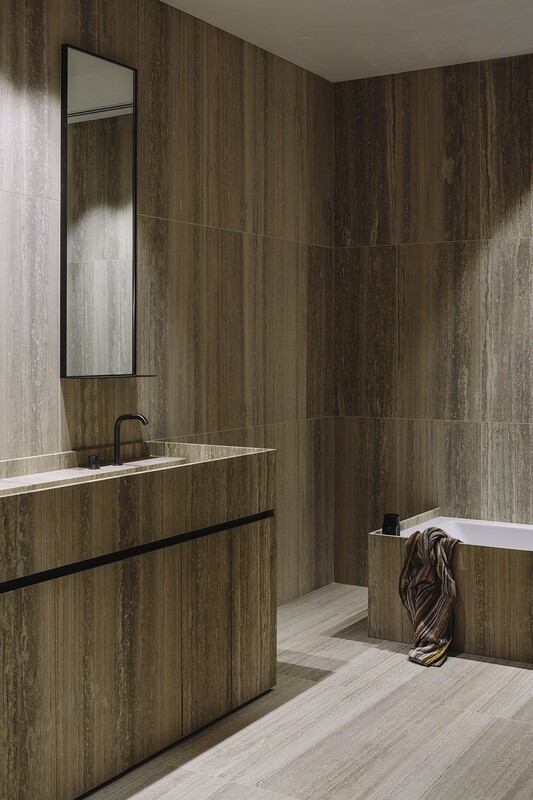 Materials and textures that were previously refined and sleek are now muted, softened, and more tactile – a palette of warm grey, earthy green, and deep purple continue Lonely’s theme of sophistication and simplicity. The Lonely brand speaks strongly about layers of intimacy so a space that focuses on the customer, their experience, and the process of buying lingerie remains essential. The Lonely Wellington space hopes to expand our vocabulary of what it means to be modern and romantic. Simon James Design is a showroom for contemporary furniture and homewares. Situated in a mid-century industrial building the showroom, originally occupying only the corner tenancy, now has a generous 250sqm open-plan arrangement. By limiting the intervention to its essentials and keeping a restrained material palette lets the selected furniture and homewares pieces speak for themselves. Lonely is womenswear that inspires a youthful creative spirit. Forward-thinking with regard to digital integration but service-focused, the store aims to beautiful, unique, and modern – yet simple. Lonely Ponsonby is a branding touch-point and a place for customers to interact and buy the products on both an analogue and digital level. The design direction needed to align with international shopping districts and that reflected the young brand's global outlook. Material and texture were key in creating an image that would complement this direction. 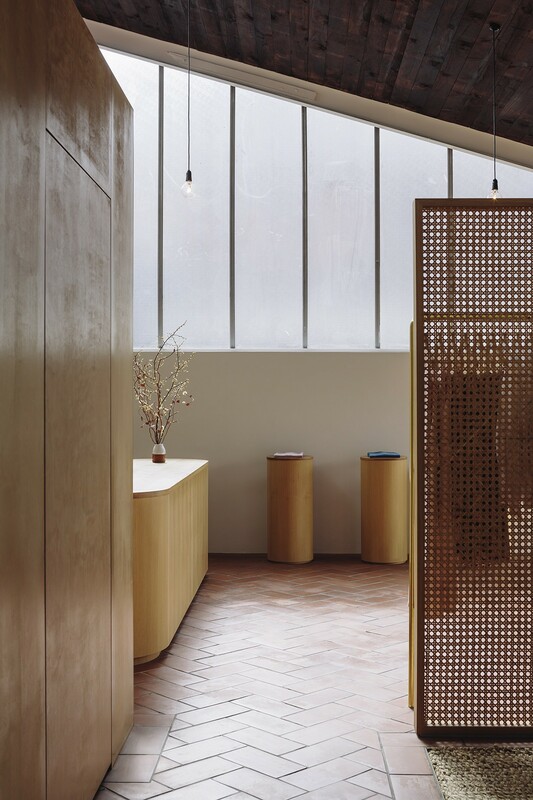 Exploring an idea of 'soft industrial' – a dichotomy between robust materials that had a tactile or unexpected finish – salvaged timber parquetry, sandblasted marble, and finely perforated mesh combine to make the store feel sophisticated without feeling unapproachable. The Lonely brand speaks strongly about layers of intimacy so creating a retail space that focuses on the customer, their experience, and the process of buying lingerie – confidence, privacy, and warmth – was essential. I wanted the space to say something romantic but in a modern vocabulary. Journalist Noelle McCarthy described Knight as having ‘a lucrative talent for translating branding ephemera into built spaces people want to be in. The work inhabits a sweet spot between art and commerce, and the spaces he creates share a luxurious tactility but not a strict aesthetic.’ Working on a global portfolio of projects, Knight Associates apply an honest and tactile aesthetic to residential, commercial, and experiential briefs from a cultural and contextually informed approach. Knight Associates' work has been published internationally and in 2015 the studio was awarded the Designers Institute of New Zealand's highest achievement for Spatial Design, the Purple Pin, for their work on the Lonely Ponsonby flagship. More recently they have curated part of the New Zealand national pavilion at the 2016 Venice Architecture Biennale, are overseeing the Interior Design of one of Auckland’s most prestigious multi-residential addresses, The International building, collaborating with global skincare company, Aēsop, and refurbishing the interiors for New Zealand’s most established fitness brands, Les Mills.